You guys know I love Framebridge. They are my go-to for almost any project and because the Internet is a creepy place, Instagram knows too! I kept getting ads for the Framebridge + Penguin Print House Collection so I finally checked it out. You got me creepy Internet algorithm. I love it. The collection features 17 different prints, including a few from Mitford at the Fashion Zoo. Which I may add, is an affordable way of getting your hands on a Donald Robertson piece. 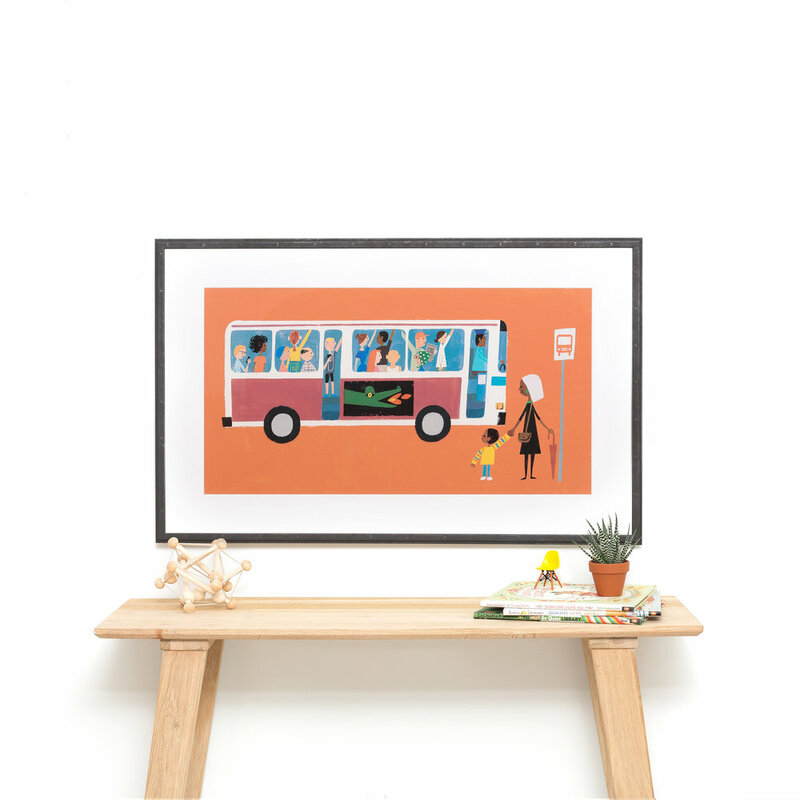 Whether you're using this series from Framebridge or not, I genuinely love how art from children's books can be used to decorate nurseries, play rooms and bedrooms (no judgement on age). It's often something I pull when I'm decorating a child's room. So how does one go about this? Well, you could always get crafty and order your child's favorite book, snip out a few pages and frame something yourself. If you were doing a nursery it could be fun to do a page from each parent's favorite children's book, or even a grid of from six or nine illustrations selected by important people in your life. I'm not really sure what the legal ramifications are, but since you're buying books it seems like a good thing (insert shrug emoji here). If you're afraid the book police will arrest you, a good deal of artists sell artwork through their websites. Oliver Jeffers comes to mind (speaking of legal, his website domain is "ojstuff.com"). I love his world map poster, and anyone who has a kid will recognize the power of his crayons poster from the book The Day the Crayons Quit (also a great gift for any kids in your life). I didn't know the Eric Carle Museum existed (Blogging! An ongoing education!) but it does and they have a store with lots of cute prints. This feels like the sort of piece you could get lost in as a child, day dreaming about the picture and making up stories. If you know other good resources please feel free to leave them in the comments.